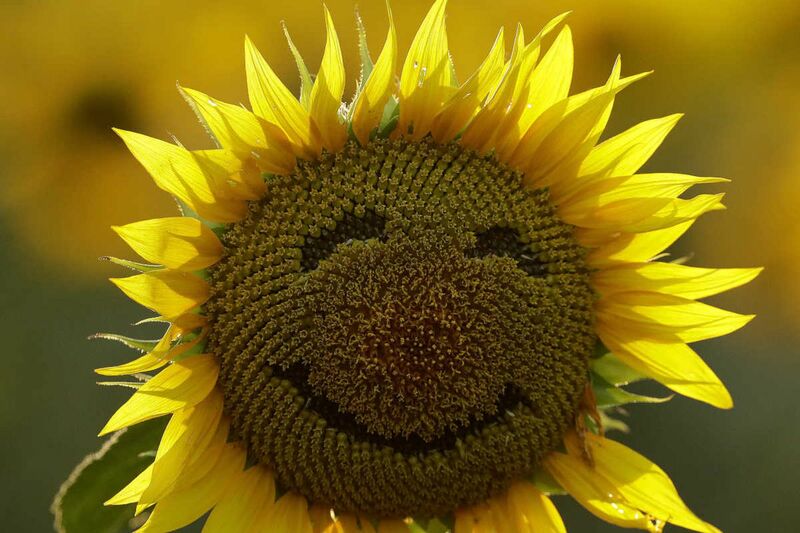 In this Sept. 7, 2016, file photo, a smiley face is seen on a sunflower in a sunflower field in Lawrence, Kan. In the General Social Survey, on a scale of 1 to 3 - where 1 represents "not too happy" and 3 means "very happy" - Americans on average give themselves a 2.18: a hair above "pretty happy." On a scale of 1 to 3, where 1 represents "not too happy" and 3 means "very happy," Americans on average give themselves a 2.18 — a hair above "pretty happy." That's a significant decline from the nation's peak happiness, as measured by the survey, of the early 1990s. There are many determinants of happiness in the United States. This year’s World Happiness Report, for instance, focuses on the role of digital media, noting that many of the activities correlated with unhappiness among young Americans — spending time on the internet, listening to music alone, social media use — typically happen on a computer or cell phone. That study also cites the opioid epidemic and the poor state of American health in general, as both drivers and symptoms of American unhappiness.